Last week, Cameron, our new family budget travel guru, talked about his travels and gave us a preview of his upcoming columns. Continuing the family travel topic, I thought it would be great to share our next reader interview on family travel. We haven’t had an interview on the topic yet, so let me introduce Marcus and Paula, a young couple from New Zealand, who took their 10-month-old to Europe. They sat down virtually and talked about their trip, how they saved, and what it was like to travel with a baby. Nomadic Matt: Introduce yourself to everyone! Marcus: Paula and I are a young couple (24 and 25, respectively) lucky enough to call New Zealand home. We currently live in Auckland, where I work as a construction surveyor and Paula is a part-time occupational therapist. Our little man Cohen keeps us pretty busy, challenges us, and helps us appreciate the little things in life. We aim to live an adventurous life, make the most of the opportunities that surround us, and lose ourselves in wonder at the extraordinary world we find ourselves in. We’re trying to fit Cohen into our camping and traveling lifestyle. Last summer, we took him (then only 10 months old) on a month-long backpacking trip through parts of Europe. What inspired your trip to Europe? Traveling to Europe was a dream of ours for a long time. We were motivated afresh by a trip to the Cook Islands where (because I screwed up) we had to sort out our accommodation at the last minute. We ended up at a hostel and discovered that we actually preferred the budget backpacking style of travel to the resort hopping we did for the rest of that trip! Fast forward a year, and our dream of traveling to Europe became a recurring theme, inspiring plenty of thinking and conversations. We couldn’t ignore our dream any longer, so we bit the bullet and took off with Cohen. 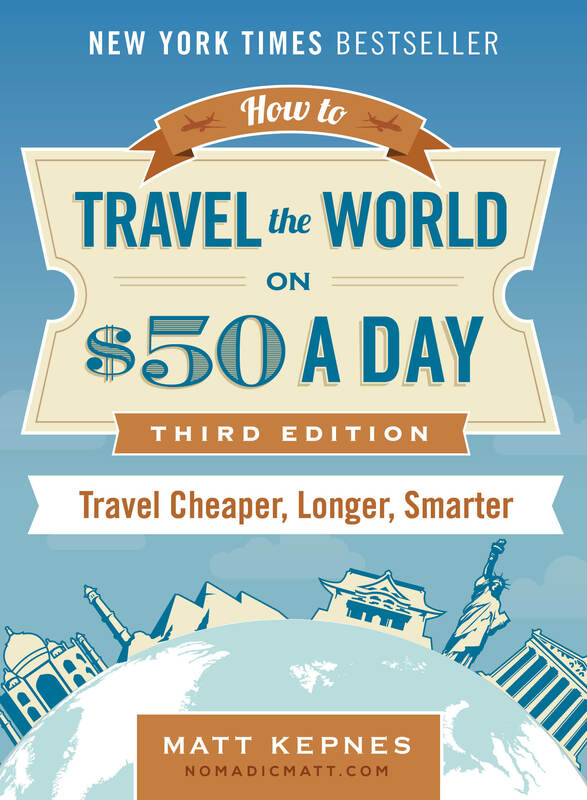 How did you save for your trip? Before having Cohen, we were working and diligently saving one income toward buying a house. We made plenty of sacrifices to make this happen, primarily by not splashing out on fancy gear and using the same rugged furniture from our student days. Realistically, though, it was relatively easy to save quickly when we both had full-time, professional jobs. What advice on saving money do you have for others? I think it is important to think carefully about what priorities you have in life, and be aware that it will often take significant sacrifices to make them happen. For example, at an age when many of our friends are buying houses, we took a fairly major step back from that goal by traveling overseas. We don’t regret it though, because we place a higher priority on experiencing the diverse cultures around us. How did you stay on budget when you traveled? 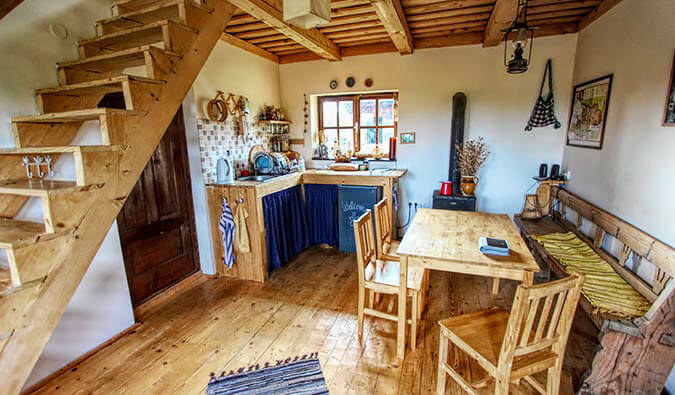 We had mixed experiences with keeping to a budget while traveling in Europe. We knew that Europe isn’t the cheapest place and that traveling with a child would mean we couldn’t travel as cheaply as if we were on our own. We weren’t keen to stay at the cheapest and nastiest accommodations with a little one, and we knew that food and diapers would cost us extra. That being said, we focused a lot on keeping our accommodation costs low by Couchsurfing in a couple of places, staying with friends of my sister, using Airbnb, and camping. We used a Eurail train pass (15 days within two months) for the bulk of our travel. I’m still undecided about whether this actually worked out cheaper than booking our own itinerary, but it was a good way to get around. We weren’t perfect though! Spending a bit over a week in Switzerland was not a good budget decision but we don’t regret going there. We definitely didn’t budget enough for the “Swiss chocolate fund”! 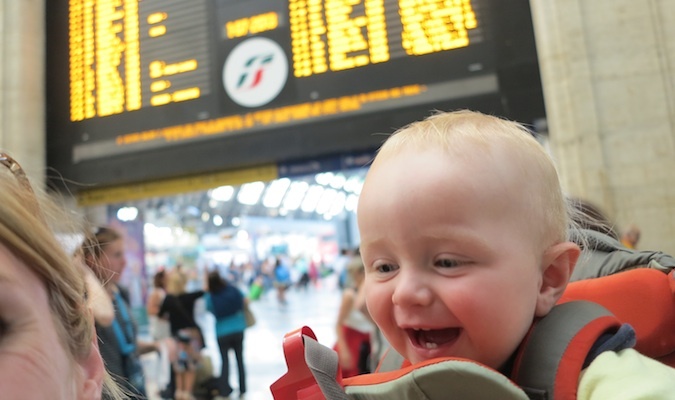 What was it like traveling with a 10-month-old? It was, without a doubt, harder than traveling solo or as a couple. At the same time, though, it was uniquely enjoyable and drew us into a number of experiences we would never have had if we hadn’t been with Cohen. We found that traveling with an infant easily broke down a lot of the barriers between us and the locals. There was the lovely lady at the Italian campground who couldn’t speak a word of English, but just loved Cohen and enjoyed holding him as we awkwardly tried to sign how old our bambino was. She gave Cohen a little Italian picture book when we left. There were countless conversations with locals on public transport, as Cohen shamelessly tried to woo them over by smiling and waving at them. We take great pride in the fact that we managed to “pull it off.” We still love the reactions we get from people when we tell them we’ve been to Europe with Cohen. Although he won’t remember any of it, it will be fun to tell Cohen about how he first tasted chocolate in Switzerland and gelato in Italy. We still fight the travel bug and can’t wait to travel back to some of these places when our kids have grown older. Now that we have traveled with a 10-month-old we feel like any other travel we do will be quite relaxing! What advice do you have for other couples with a young baby? You can (and should) still pack light when you have an infant. We initially took two packs (one of which was a baby carrier) and a daypack. After only a couple of days in Amsterdam, however, we realized we had too much stuff and posted a box home so we could jettison the daybag! We operated on having one pack for both Paula’s and my gear, and a pack for all Cohen’s gear (including diapers, clothing, bedding, etc.). I would recommend being more proactive about planning out accommodation in advance. I had romantic ideas of just winging things and arranging accommodation as we went. In reality, it’s not a nice feeling when you have a baby to look after and you don’t know where you will be staying that night. It may feel adventurous as a single person who can crash in any dingy old hostel room, but it feels sickeningly irresponsible when you are traveling as a family! This alone meant we spent too much time stressing in Internet cafés and not enough time enjoying the towns we were in. It’s important when traveling with a young baby to try and preserve some of the routines as best you can. We intentionally introduced a particular bedtime teddy to Cohen in the months preceding our trip, so that Cohen would have a familiar toy when we traveled. We also tried to keep his bedtimes relatively consistent (as best we could) in all the places we stayed. What was the hardest part about your trip? Without a doubt the hardest part was not being able to experience the nightlife in the cities we visited. As I mentioned, we tried to keep Cohen’s routine as regular as possible… and this meant putting him to bed around 7:00 most nights. With Cohen in bed we couldn’t do much other than sit around in the hotel room, reading books and playing cards. This is another instance where Couchsurfing came in handy. Although still house-bound in the evenings, we could still take in the culture by enjoying late evenings chatting with our hosts. As I’ve mentioned, having a baby in tow led to many easy openings into friendly exchanges with the locals. This meant we actually found it easier to engage with the culture than we would have without Cohen. Having Cohen with us also had advantages when sometimes we were called to the front of the queue, and when dealing with customer services staff. People generally seemed more inclined to help when we were clearly a couple of lost tourists with a baby. Do you have any parting advice? If you’re traveling without children, make sure you enjoy the little things like being able to watch a whole, uninterrupted, movie on a long-haul flight, being being able to eat meals at your own pace, without having to take turns watching the other person eat while keeping a child from throwing food everywhere. Or walking out of your chosen accommodation on a whim, without worrying you’ve forgotten something important like diapers or wipes. Perhaps the best thing about traveling with an infant meant we got a fresh appreciation of the simple pleasures we took for granted as a young couple. 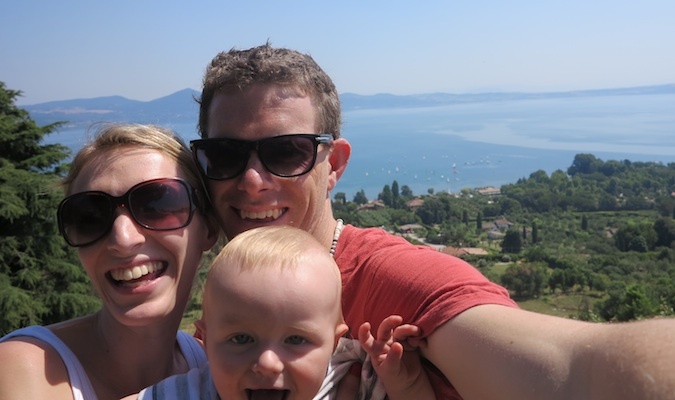 It may seem daunting to travel with a baby but as Cameron and now Marcus has shown us, it’s possible. Stop waiting, start planning, and go. Your baby isn’t getting any younger! One of my favorite parts about this job is hearing people’s travel stories. They inspire me, but more importantly, they also inspire you. I travel a certain way, but there are many ways to fund your trips and travel the world, and I hope these stories show you that there is more than one way to travel and that it’s within your grasp to reach your travel goals. We all want to travel more. Great post. I thought that traveling with a baby would almost impossible but you have manage to do it really well. I guess keeping the routine for the baby is important and it must be hard for you guys to miss out on all the night life, I admire your sacrifice, but I like how easy it is communicate with the locals by just having a baby, for some reason everyone can speak to a baby regardless of language. I love hearing about parents that take their kids on adventures. 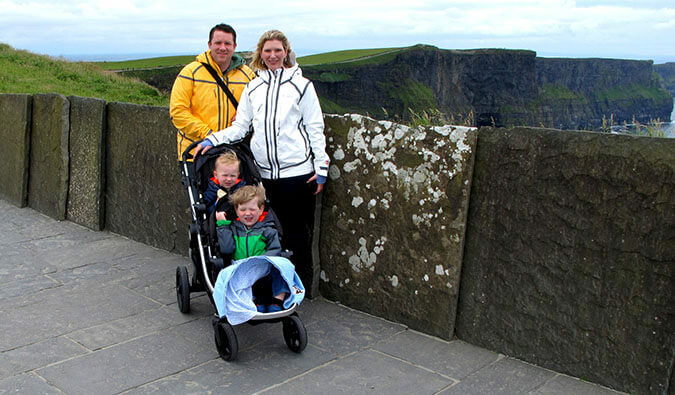 I travel with my two toddlers and although it costs more, the experience so rewarding. I still try to sneak in nightlife, I make the strollers super comfy so they’ll fall asleep or find places with live music that keep them entertained while mama has a drink with some atmosphere. Thanks for sharing your story Marcus and Paula! I was wondering if you (or anyone) had thoughts on how to deal with babies + jet lag? My wife and I are considering a Europe trip next April-May with our then-10 month old and the 7+ hour time difference seems like the most daunting challenge. Any tips or tricks? or just budget for a couple days of insanity? Also…our boy is 5-months old tomorrow is changing every day (teething, interests, attention span, mobility, etc). Any thoughts on the best infant age to travel? Great question! I should have touched on this in the post but must have forgotten. I would definitely recommend booking yourself in to a hotel for the first couple of nights, asking for a room with good soundproofing! We went straight from the airport into an airbnb situation, which was awesome except for the fact that we were paranoid any time Cohen stirred that he’d wake up our host family. If we were on our own somewhere we would probably have let him cry it out more and hopefully settle himself back to sleep. As it is we fed him straightaway every time he cried in the night, which became a pattern that lasted the whole trip. Cohen had been sleeping through the night at home, but during our travels he generally woke up once in the night. Re: the ideal infant age I would say a little younger than 10 months would have been easier. Cohen only just fitted in the airline provided cribs…and I hate to think how our flights would have been if he had been any bigger! Though he wasn’t walking at that stage, he was definitely mobile which meant it was a bit more work to keep an eye on him than if he was younger. 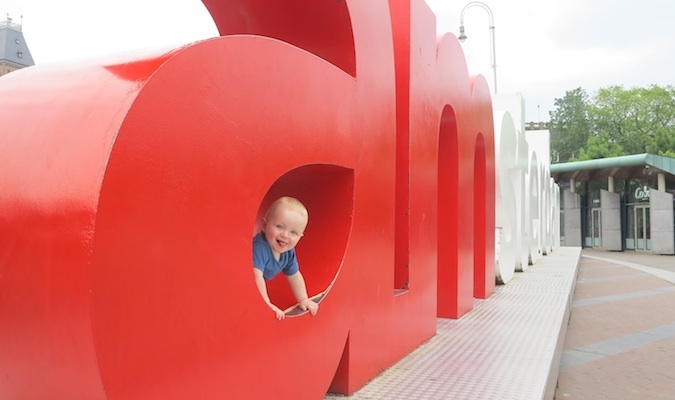 Ultimately though, I think you can have fun travelling with any age child…it’s mostly about your attitude! 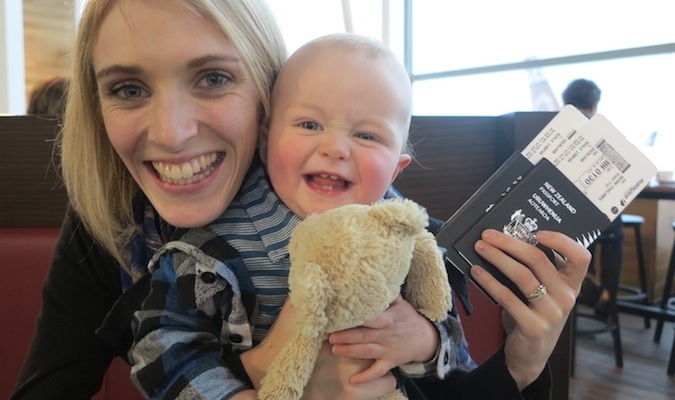 Our son took his first plane trip at the age of 5 months. We went from Belgium to Berlin. Since then he has seen the west coast of America, Italy, France, Norway, Croatia, Austria, Quatar and we are currently in Cambodia. He is now 5. We find that you indeed have to plan a bit more in advance, but that generally speaking travelling with a child opens doors which otherwise would probably stay closed. People react differently to a child as a tourist, than to an adult. We can only say: go ahead and travel with your children! I have been moving around the world for 30 years – initially travelling alone and later with 3 kids in tow as a single mum. I tend to move countries and stay for a bit – the kids have schooled in about 10 countries – but travel in between. I started backpacking with a baby / toddler in Central America in the early 90s and have travelled with the kids at all ages in Central America, Asia, Europe, Aus/ NZ, Canada etc. It is a great way to travel and opens doors as said. It can create issues in funny ways – like trying to get budget accommodation in Paris with a baby (not easy – hope its changed) and one unexpected issue I had in Central America was the local people all rushing up to hug and touch my daughter who got really really sick of it – which meant, so as not to offend people, I had to keep her on my back a lot of the time! (I think a lot more people travel there with kids now so its probably not a big drama – certainly wasn’t with older kids in the last few years anyway – but back then a curly headed blonde baby was a bit of a magnet for attention) But apart from those couple of things it was generally great. I don’t agree with keeping a routine as some have said – but then I hate routine so never made my kids have one – that suited me better. So I think its just up to you. Yes a comfy stroller (I had to have one as with only one parent you cant carry a backpack and a baby all on your back) is a great idea to enable you to get out and have some nightlife – and in the latino countries this works really well. To Colin who asks about best age to travel with a baby / child – any age is good and each age has its pros and cons – but I think the main thing is your attitude and ability to just take it as it comes – its never going to all work out as planned (if you have a plan) but then other things will happen that will make it great. Just make sure you have really good medical insurance. My daughter had an accident in Guatemala and needed small surgery – and we have ended up in hospitals in Costa Rica and Spain. Wherever I am living or travelling I make sure we have good cover just in case. You guys are amazing! Everyone thinks I am insane for planning to backpack through Italy with my baby. 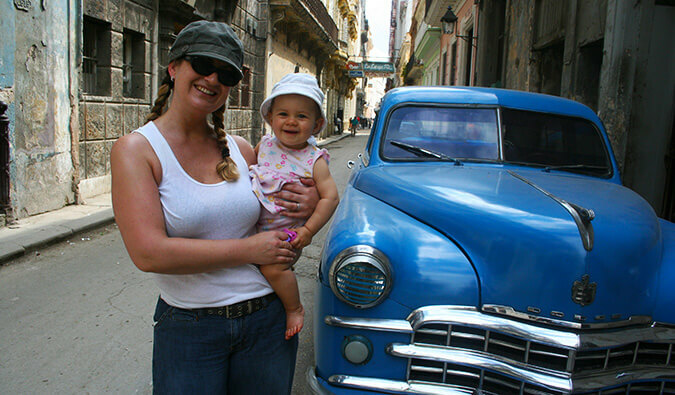 We need more people in the world like your family to show how much traveling with your children enhances your whole experience. Happy travels! Thank you! I so needed to read this. It made me cry (with happiness). I had thought my travel days would basically be over when I had a baby. There are still so many places I want to go, and to think I can still do it makes me relieved and inspired. Thank you!